For those who do not wish to participate in walking events, there will be a ‘Beauty & Therapy’ afternoon at The Sallows in Lower Main St., Clogheen, Registration at 14.00 for event at 14.30. Linda from Lavender Lane will be available with a selection of products from the Lavender Lane line. Tickets limited to just 30 places. 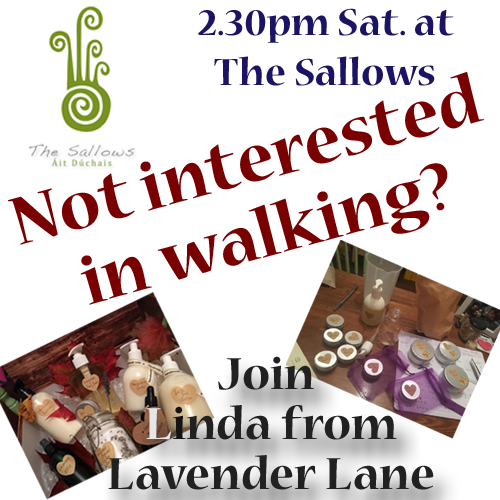 For those who do not wish to participate in walking events, there will be a ‘Beauty & Therapy’ afternoon at The Sallows in Lower Main St., Clogheen. Registration at 14.00 on Monday June 3rd for event at 14.30.